Van Asch products have been featured in many magazines. Here is just a small sample. Leva & Bo magazine weekend supplement with Expressen Newspaper No. 12/ 2013. Älskade Hem magazine issue 2, 2013 features one of my hand made one-off cushions in the home of celebrity Kattis Ahlström. 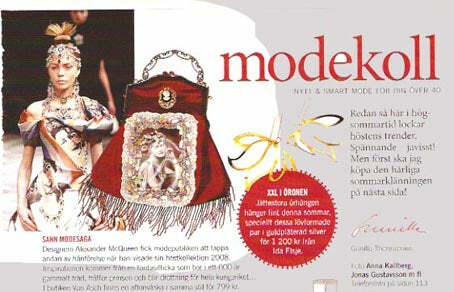 Vårt Nya Hem Issue 3 2012 features a selection of our jewellery, Queen of Birds canvas and Treasure printed cushion. 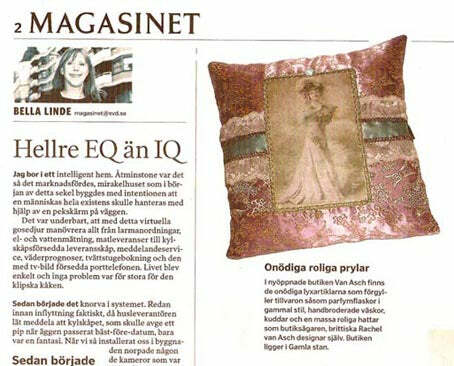 Seaside Blue Stripe & Steam Lady of Cogs Printed cushions featurered in July/August 2011 issue of Allt i Hemmet magazine. Shabby Chic Antique style cushion featured in Drömhem & Trädgård magazine issue 13 2010. 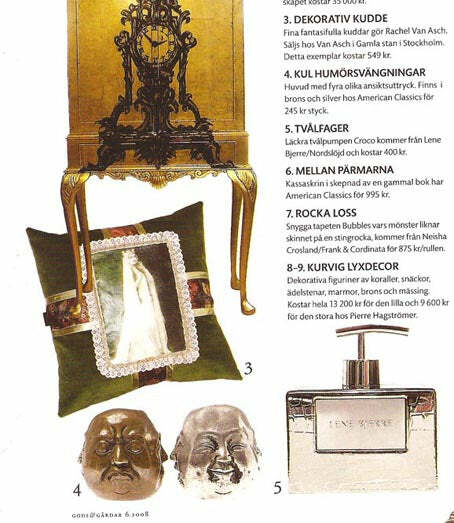 Pin-Up Babe Art Cushion featured in Vårt Nya Hem (Our New Home) magazine issue 10 2010. 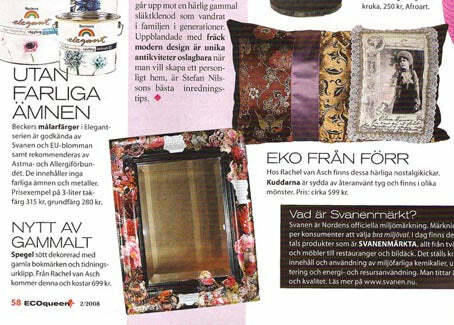 2 of our Handmade cushions in the March 13-14th 2010 supplement for Aftonbladet, Sweden’s biggest newspaper. Here is one of our handmade cushions featured in Hus & Hem issue 14 2009. Another of my unique art cushions featurerd here in Gods & Gårdar Nr 6 2008.